Diamond Haus » Blog Archives » ideeli – A new diamond? ideeli – A new diamond? Today marked the beginning of a two day Daily Deal by eBay seller ideeli. 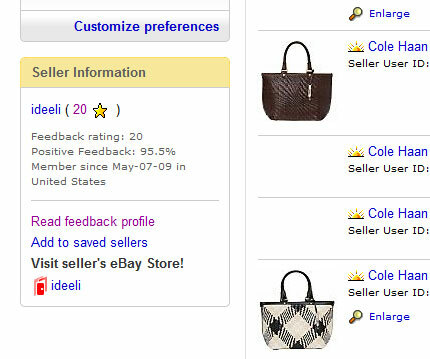 ideeli is a relative newcomer to eBay having registered May 7th, having received 22 feedbacks (14 5.0 DSRs) so far, but who currently has 647 active listings. It has been witnessed by many on Auctionbytes and the eBay forums that they just had their first negative feedback removed. If anyone has a screenshot of that negative feedback please contact us. Is ideeli a new diamond powerseller? Either way they’ve been added to the list until we hear otherwise. Diamond Haus has obtained proof that ideeli has had negative feedback removed. This in itself is not proof that there was any wrongdoing or manipulation on eBay’s part as there are many reasons for feedback to be removed. Once we are able to see the actual negative and who left it we’ll be able to make a determination. It’s as you read through my mind! You seem to be aware of a great deal approximately the following, such as you composed a e-book within it or something like that. I believe that you may possibly do with a couple of s. d. so that you can tension your message dwelling slightly, but instead of of which, that’s great blog Great Childrens. An awesome examine. I am going to certainly return to their office.